A week ago we asked our Facebook community to share words of comfort to three Freshpet dogs going through end stages of cancer. In response, we were overflowing with messages of strength, heartfelt quotes and stories of those going through the same thing. Dog mom Lisa reached out to tell us about Abby. Her beautiful girl stopped eating after being diagnosed, but Freshpet rolls got her excited about dinner time again. Her favorite treat was Wag-gurt. Then Andrea sent us a note sharing with us that both her pups Calvin and Hobbes were battling cancer but found that Freshpet meals and treats helped to brighten their appetite. We were so moved by not only Lisa and Andrea's letters, but all of your condolences, that we decided to surprise Abby, Calvin and Hobbs with a Thank You. 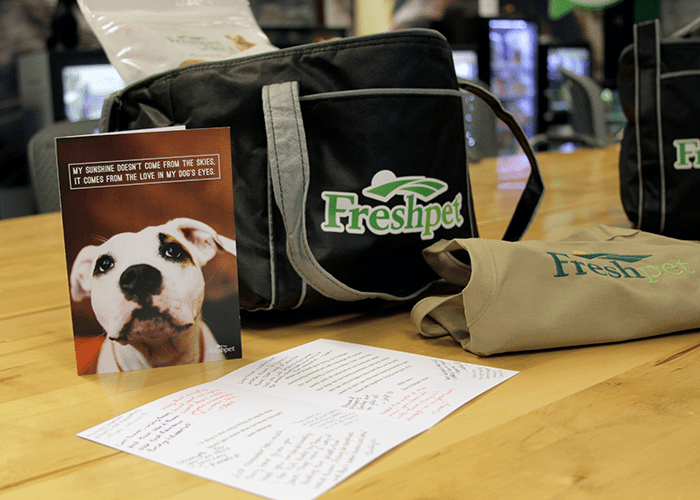 A special card with some of your Facebook messages and care packages filled with their favorite Freshpet meals. Sadly, since we sent our packages, Abby and Calvin lost their battle to cancer. We're happy to hear that Hobbes is still fighting through. Both parents were touched by your heartwarming words. 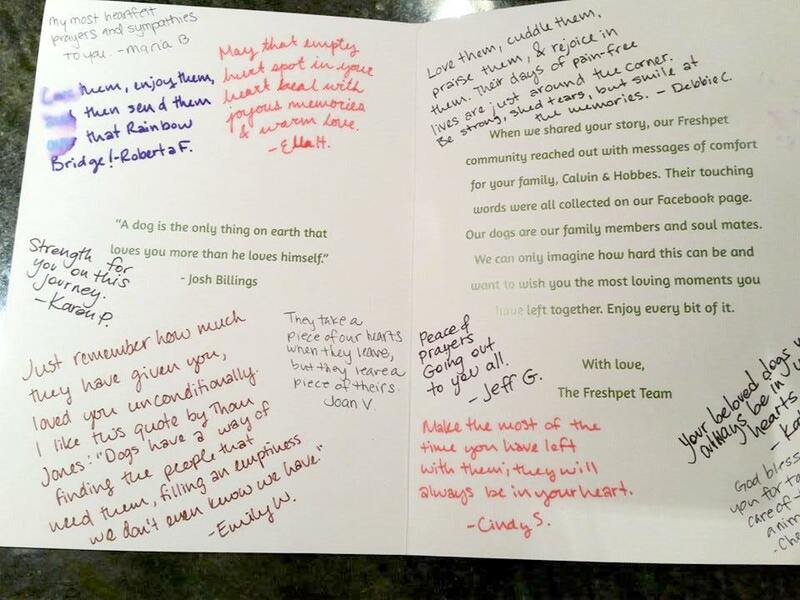 Lisa shared, "Abby received her surprise from Freshpet. Thank you so much for all the goodies and the kind card. 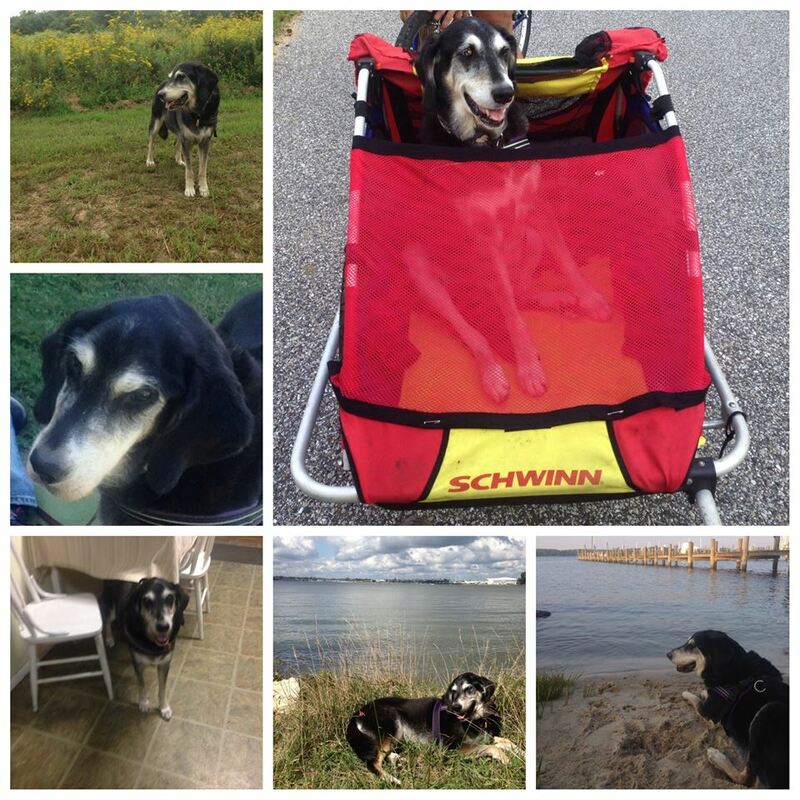 It meant a lot to us... She was truly a special dog, a once in a lifetime dog." Andrea was also surprised and thankful for the gesture saying, "You know your dogs are extra special when their 'chefs' send them something special." We're so happy all of you chimed in to complete this gift to their dogs. It's always wonderful to see our community care about one another especially during difficult times of loss.